Bryer Garcia, owner of a new coffee shop, Wolf's Brew, at 4145 Norse Way. Photos by Asia Morris. On a quiet diagonal connecting the corner of E. Carson Street and Lakewood Boulevard a new coffee shop stands out next to a nail salon and a vintage boutique. A “going out of business” sign is on the sidewalk in front of the gift shop, and gone are the trees that once lined the street, likely removed for the repair of the pavement and new layer of asphalt recently added outside. 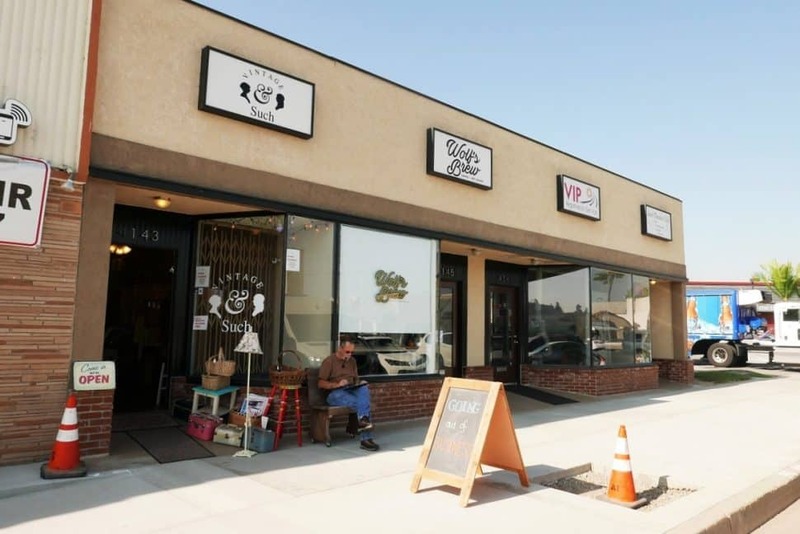 This section of Lakewood Village, located nearby new retail center Long Beach Exchange and a half mile from Long Beach City College’s liberal arts campus, seems to be undergoing a makeover, with the owner of Wolf’s Brew—a specialty coffee shop and art gallery that opened here just over a month ago on Norse Way—Bryer Garcia, saying it’s about time. “When we first started this project, we started it over here on purpose because the market has always been focused on downtown and 4th Street,” said Garcia, who grew up in Long Beach. Garcia signed the lease for the space more than a year ago, when the only nearby shop was Eco Coffee House, not counting the drive-thru Starbucks on Lakewood Boulevard. Even after Dunkin’ Donuts and Portola moved in to LBX, the community still saw the need for an independent purveyor, Garcia noted. With an extensive background in retail management, working for companies such as Vans and H&M, and later entering the restaurant industry working for Congregation Ale House in Pasadena, Garcia also worked at Starbucks for five years, a time in his life he believes was a stepping stone to opening Wolf’s Brew. However, those who frequent Recreational Coffee in downtown Long Beach might already be familiar with the taste. 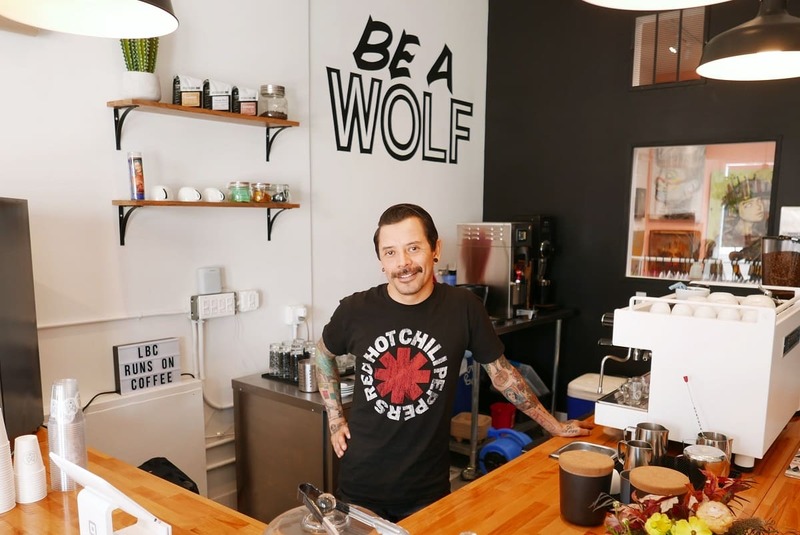 With a focus on using beans from Central America or nearby, a nod to the Garcia family roots— Garcia’s father is from Guatemala and his mother is from El Salvador—Wolf’s Brew uses Recreational’s beans in all their drinks. The local roaster’s Guatemala Hunapu and Columbia Onias Garcia are placed proudly on the shelves. It’s a strong start, with Garcia planning to try out other roasters in the future. 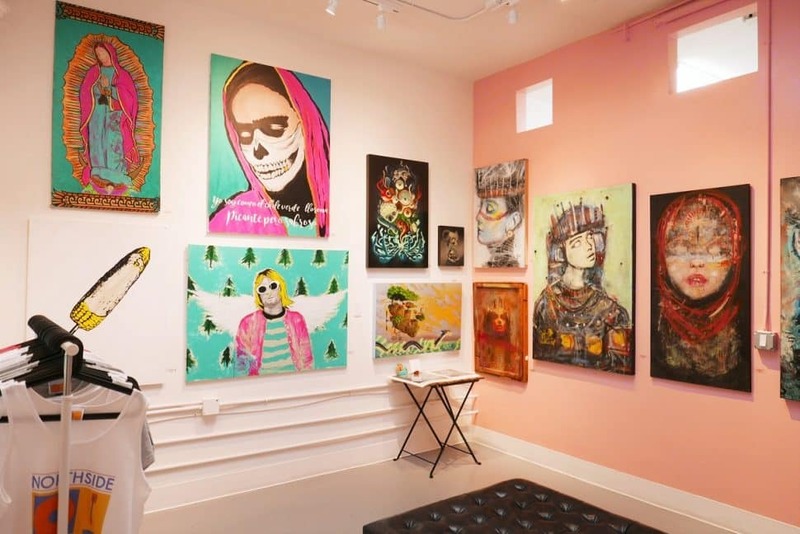 And while Garcia harbors a love for art based on his own ventures in photography, you won’t find any paintings hung above the heads of coffee sippers seated inside, you’ll find them in a separate room behind the bar in a tiny 10-by-11-foot space that feels like an art gallery. 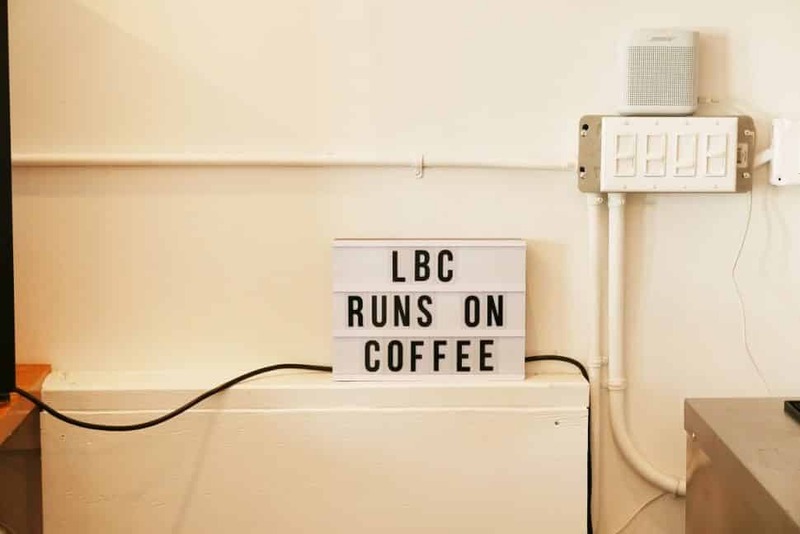 Sure, you can bring your coffee into the mini-museum, complete with a wall painted that trendy pink so often paired with dangling pothos plants, but your experience there will be more about the art or thumbing through records from Northside LB, than what a typical coffee shop has to offer. Garcia took inspiration from Wacko, the eclectic curios mega shop in Los Angeles’ Los Feliz Village; walking in you’re both overwhelmed and delighted by the art books, pop-culture ephemera, trinkets crowding the shelves, but stepping into the art gallery (La Luz de Jesus) near the back of the store feels like a completely different experience, it shifts your focus to the art and the art alone. While Garcia is the face of the business, Wolf’s Brew is 100 percent a family matter, he said. His wife, Vanessa Winn-Garcia is part owner, while his brother, Jay, is Garcia’s right-hand man. The name Wolf’s Brew comes from the nature of the beast. For more information, check out the Wolf’s Brew Instagram @wolfsbrew_lb. Hours are Tuesday through Friday 8 a.m. to 4 p.m., Saturday 10 a.m. to 4 p.m. and Sunday 10 a.m. to 3 p.m., closed Mondays. Wolf’s Brew is located at 4145 Norse Way.